COMING UP in the Spring 2008 issue. . .
With the development of low-cost inertial sensors and GPS technology, microelectromechanical system–based INS/GPS navigation designs are beginning to meet the increasing demands of lower cost, smaller size, and seamless (uninterrupted positioning) solutions for land vehicles. Although MEMS inertial sensors are very low cost when compared to conventional sensors, their cost (especially MEMS gyros) is still not acceptable for many low-end civilian applications (e.g. commercial car or personal location systems). The article explores the possibility of reducing the number of gyros (and associated costs) in an automotive navigation system by incorporating other information — derived observations reflecting the behavior of a typical land vehicle and vehicle frame measurements from the vehicle’s odometer or anti-lock breaking system — to aid positioning. As GNSS positioning moves into ever more mobile and electromagnetically and operationally challenging environments, receiver designers must figure out how to make user equipment sensitive and robust enough to perform well while simultaneously minimizing cost and power requirements. This article covers such issues of receiver design as internal signal interference, integration with existing platform architecture, software-based designs, and common errors in design assumptions. 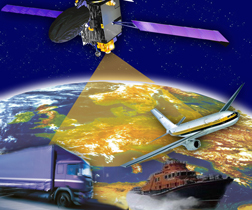 The article describes the development of a second-generation GNSS receiver that provides all-in-view, all-frequencies tracking of Galileo and GPS signals, including AltBOC tracking of the Galileo E5 frequency in a bandwidth of 72 MHz. The authors describe in detail the key elements of ARTUS, which is designed for professional and scientific applications. Overall receiver performance is characterized based on laboratory-simulated signals as well as signals in space simulated within the German Galileo Test Environment (GATE). A relatively new signal design, the binary offset carrier (BOC), has been adopted by the European Union and the United States for implementation on Galileo’s Open Service and the modernized GPS L1C civil signal. Receiver designers are currently working on signal tracking and processing technical issues associated with the new design including the apparently inherent nature of multi-peaked correlation properties due to BOC sub-carrier modulation that can cause “false lock” or “false node tracking” on a secondary rather than the primary peak. This article describes a two-dimensional method for re-modulating an incoming BOC signal with the sub-carrier in the receiver to eliminate the secondary peaks, leaving only the need to track the code component with a code replica and deliver a code delay estimate. GNSS Solutions and Working Papers are on vacation Spring 2008. They will return May/June 2008.